This entry was posted on July 30, 2015 at 1:00 am and is filed under Other People's Stories. You can follow any responses to this entry through the RSS 2.0 feed. You can leave a response, or trackback from your own site. This is a really good time to (re)discover Clarke, since with the announcement of a TV mini-series (yeah, I’m dubious too) of Childhood’s End a fair bit of his work is being re-released. My favorite Clarke stories are in Tales from the White Hart. Don’t know what that says about my lowbrow tastes, but not so much sensawunda there. Part of my problem is that I know enough to be jaded. Just yesterday, I learned about the Supergroups that are replacing kingdoms as the main branches of the Tree of Life. Neat stuff that I’m not going to explain here (the new terms are annoying, but learnable. Frackin’ cladists). So I see this radical reorganization, which makes it clear that multicellular organisms arose something like four or five separate times in four or five separate ways, and I get a real sense of wonder. Life is just so neat, and so good at taking bugs and turning them into essential features. Wow. And then I turn to McDevitt’s A Talent for War, after reading about it here last week. It’s a good book, a hybrid between a cozy mystery and a space opera. Nicely done, but the details (especially his dating system) are jarring. It’s just too cozy in the face of millennia, light years, and planets that aren’t properly alien. Worse, I’m reading it now, so a lot of presumably innocent choices, like the confederacy, and the romantic rebellion of underdogs led by a genius general, and the classicism, have a distinct dog-whistle political note that sounds sour now after the events of the last few months. It’s a book where everyone sounds like a white male, whatever their stated gender and skin color are. Good book? Yes. Sensawunda? Not so much. Sorry. One that hasn’t been mentioned is “A Fall of Moondust” (1961), nominated for the Hugo, first SF novel to get into a Reader’s Digest condensed book version. Story of trying to rescue a passenger tourist moon vehicle sunk under dust after a moonquake. 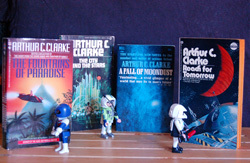 But the first Clarke book that stirred a sense of wonder in me wasn’t even fiction; it was his “The Conquest of Space,” a gift to me from a great-aunt who belonged to the Book of the Month Club (it was an alternate selection), back in 1951 when I was still in grade school. It was full of new concepts to me, what was known then about the planets, how they might be colonized, the difference between “galaxy,” “universe” and “cosmos,” and so much else, complete with illustrations. To say it expanded my sense of wonder about space is like saying Angelina Jolie is a woman; it’s true, it just doesn’t tell the whole story. A FALL OF MOONDUST sounds familiar… I may need to see if I read that one. Wouldn’t it be neat to do an alternate history using what was known about the planets etc then, as if it was all there was to know? Asimov did something like that long ago, when a paperback publisher re-issued his YA “Lucky Starr” books (originally as by “Paul French”). Each was set at a different place in the solar system, and he did an afterward in the new versions about all that was wrong with the original settings.